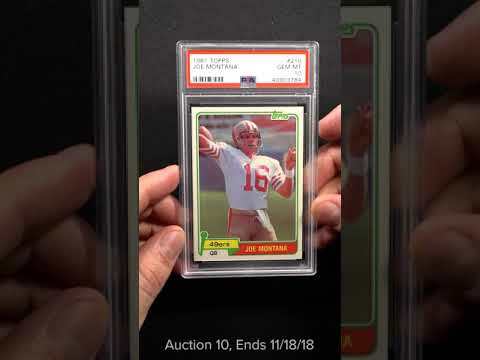 Arguably the most important 1980s Football rookie card in the hobby and highly sought after in PSA 10. Joe Montana was never the fastest or the strongest quarterback, however he possessed tremendous intelligence and poise, which lead to countless wins in San Francisco. His '81 Topps production is a condition sensitive issue which is exceedingly tough to locate in GEM MINT condition; in fact only a little over 100 copies have reached the elite assessment. There simply aren't enough of these to satisfy the demand. The offered masterpiece is perfect from every angle and represents one of the best 10s we've seen in some time. Dead centered with four untouched corners and immaculate surfaces. Free of typical excess print with flawless color and clarity. They simply don't get any better than this. In our eyes, PSA 10 Montana rookies are still very much under valued and seem destined to only increase in value. Comes highly recommended by PWCC. One of over 16,000 cards, lots and sets up for bid in our 10th Auction of 2018. Click on the link above to view the other PWCC auction lots.